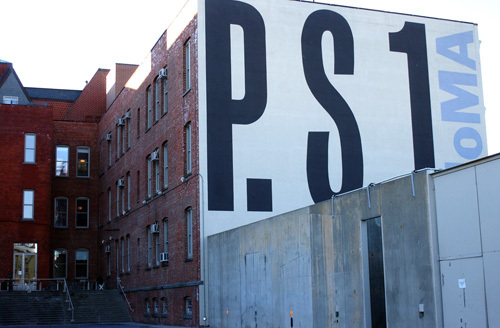 Housed in an old school building in all its white space glory, the P.S. 1 MoMA is a complete contrast to 5Pointz. Even the entrance is dramatic. As soon as I walked past the gate, I was surrounded by concrete walls (sans graffiti). A narrow paved walkway led to the stairs, while the rest of the yard was covered in gravel. As you might have inferred from its name, the museum is housed in an old school building. The stairwells are prison-like and fenced in, many of the halls are windowless, and the classrooms seemed to have retained their original doors. I couldn’t take pictures of the artwork of course, but the receptionist said I could take pictures of the building. I decided the $5 fee wasn’t bad for a detour, and I soon found myself, no surprise here, getting lost. To the bathroom. With a map in hand. “But, but the building…” I said. “The ‘EXIT’ signs are considered artwork,” said that same receptionist. Traitor. There must have been something special about them, though I didn’t know what. Like all EXIT signs, they were red, this time painted on the dangling light fixtures lining the hallway. Maybe they were in a slightly different font? A slightly different shade of red? 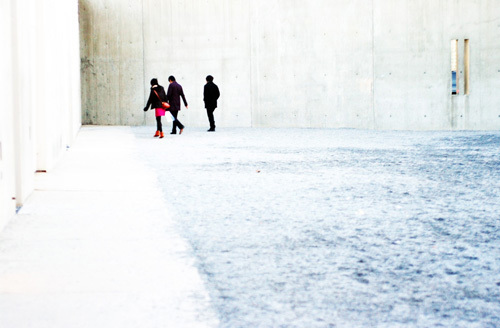 P.S.1 Contemporary Art Center is one of the oldest and largest non-profit contemporary art institutions in the United States. An exhibition space rather than a collecting institution, P.S.1 devotes its energy and resources to displaying the most experimental art in the world. A catalyst and an advocate for new ideas, discourses, and trends in contemporary art, P.S.1 actively pursues emerging artists, new genres, and adventurous new work by recognized artists in an effort to support innovation in contemporary art. P.S.1 achieves this mission by presenting its diverse program to a broad audience in a unique and welcoming environment in which visitors can discover and explore the work of contemporary artists. P.S.1 presents over 50 exhibitions each year, including artists’ retrospectives, site-specific installations, historical surveys, arts from across the United States and the world, and a full schedule of music and performance programming. An exhibit somewhere on the second or third floor held remnants of 1969. One room featured newspapers glued to the floor, and as the barely yellowing pages left me questioning if indeed they were from 1969, I leaned in closer when I heard, “Miss…” I looked at my feet to see I’d crossed the line marking the appropriate distance I should have kept between myself and said papers. I left the exhibit to walk the halls. Out of a large window, I saw the skyline. I shot a picture at last, suddenly wishing I’d spent the day outside instead. I wouldn’t be surprised if a sociological experiment lay in the confines of that old school building. I felt restricted, unable to do the simplest things without getting admonished to behave in a certain manner so as not to offend. In other words, it was elementary school all over again.